From research and discoveries, to educational outreach programs focused on first responders and the underserved, Sylvester is a beacon of hope for many of the estimated 1.7 million diagnosed with cancer in the US last year. 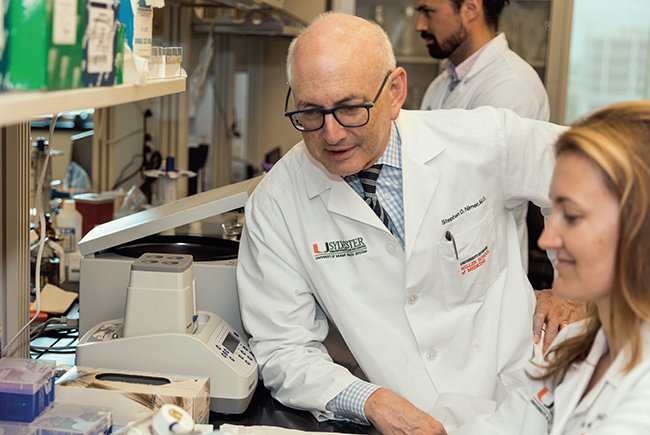 “From our grant funding, to our high-impact research and publications, to our leadership in pioneering precision medicine, we’re having a huge impact on the national stage,” said Stephen D. Nimer, M.D., director of Sylvester Comprehensive Cancer Center. Craig H. Moskowitz, M.D., as Physician-in-Chief. Dr. Moskowitz is one of the world’s leading experts on lymphoma, most recently with Memorial Sloan Kettering Cancer Center. Frank J. Penedo, Ph.D., as professor, associate director for cancer survivorship and translational behavioral research, and co-lead of the cancer control research program. An internationally recognized expert in cancer survivorship and psychosocial oncology, he joined the center from Northwestern University. Alan Pollack, M.D., Ph.D., Sylvester’s deputy director, had one of the lead presentations at the annual meeting of the American Society for Radiation Oncology on the SPPORT trial. He reported how the addition of pelvic lymph node radiation treatment and short-term androgen deprivation therapy reduced the risk for disease progression among men with prostate cancer. Dipen J. Parekh, M.D., chair of urology and director of robotic surgery, published findings in the journal Lancet on the Randomized Open Versus Robotic Cystectomy (RAZOR) trial. That study compared the outcomes of robotic surgery to those of traditional open surgery in treating bladder cancer. Minimally-invasive robotic surgery led to lower blood loss and blood transfusion rates and shorter hospital stays, with no differences in complication rates. Gilberto de Lima Lopes Jr., M.D., associate director of global oncology and associate professor of clinical medicine, had a plenary presentation at the American Society of Clinical Oncology which showed an immunotherapy provided more benefit than chemotherapy as a first line of treatment for most patients with advanced non-small cell lung cancer. These studies reveal how Sylvester research is changing the way cancer is treated today – and will be in the future. Underserved communities suffer higher cancer incidence and mortality, in part because they lack basic services. Sylvester’s “Game Changer” vehicle now brings free cancer screenings and health information to Little Haiti, Liberty City, South Miami-Dade and LGBTQ neighborhoods. The van is wrapped in colorful art by renowned Miami artist Peter Tunney. Faces and gear smeared with soot and ash were once badges of honor among many firefighters. Sylvester researchers have found that the increased incidence of skin melanoma at a younger age among Florida firefighters may stem from exposure to carcinogens released by fires. Absorption through the skin is exacerbated by Florida’s heat and humidity. Developing and distributing wristbands which are part of the environmental sampling program to measure chemical exposure during a shift. This year 4,200 decontamination kits were sent to firefighters statewide to help reduce their risk. Promoting a “Shower Within an Hour” campaign encouraging firefighters to bathe immediately after exposure to potentially harmful residue; discouraging them from washing their gear at home, where it could expose the family to carcinogens; and working to improve fire engine cab design to keep contaminated gear from the passenger compartment. Exploring how precision medicine can help firefighters with cancer today – and reduce risk in the future, “which is the best way to treat cancer,” said Alberto Caban-Martinez, D.O., Ph.D., assistant professor of public health sciences and FCI deputy director. “Where ash-smeared faces were a sign of pride, clean is the new badge of honor,” said Erin Kobetz, Ph.D., MPH, professor of medicine, associate director of Sylvester, and principal investigator and director of the FCI. In 2018, the State of Florida renewed funding for the FCI for a fourth year. The Florida Cancer Data System received gold certification from the North American Association of Central Cancer Registries and was recognized as a 2018 U.S. Cancer Statistics Registry for Surveillance. In 2018, Sylvester was again named a Cancer Center of Excellence by the state of Florida, the only center with that designation in South Florida.